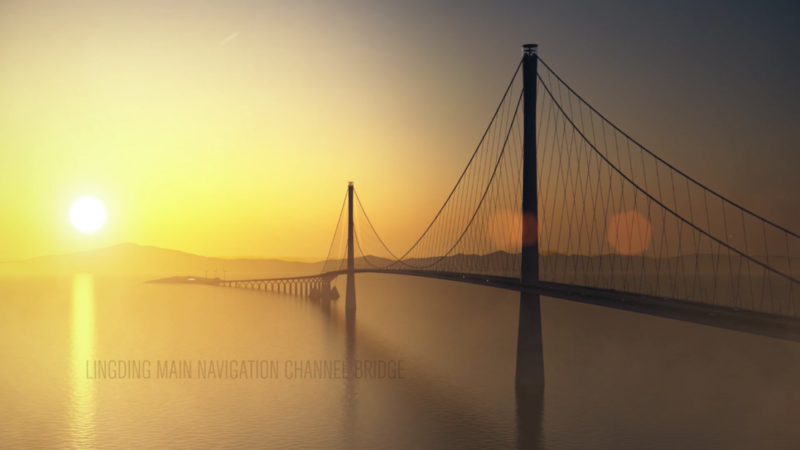 The new major coast-to-coast link in Guangdong, China, will include the world’s widest immersed road tunnel as well as two signature suspension bridges and be a strong support of further economic development in the region. Those were the key parameters in the design competition for a new coast-to-coast link connecting the cities of Shenzhen and Zhongshan in Guandong province in sourthern China. The link will be 24 kilometre long and consist of two artificial islands, two bridges and the world’s widest immersed tunnel with eight traffic lanes in duel directions and with a capacity of 90.000 cars per day. The competition was initiated by The Advanced Work Office for the ShenZhong Link Project in September 2015 and the engineering consulting group COWI and the award winning architect DISSING+WEITLING, both based in Denmark, have now been announced the winner. “Many months of hard work have paid off, and we are obviously very proud to be the winner. I simply knew from the first glance, that I was looking at an extraordinary project," says Lars Hauge, Regional Vice President, COWI. "One of our primary advantages as a team is that we have vast experience both with large suspension bridges, immersed tunnels and marine engineering. Moreover we have had an excellent teamwork with the architect DISSING + WEITLING Architecture, with whom we have a long-standing and excellent working relationship. Together we have managed to make a unique link that is both visionary and structurally daring,” says Lars Hauge. Among other projects, COWI and DISSING+WEITLING architecture are responsible for the design of the famous Danish fixed link, the 18 kilometre long crossing of the Great Belt linking the eastern and western parts of Denmark. Both companies were also deeply involved in the Öresund Bridge linking Copenhagen with Malmoe as well as the Hong Kong – Zhuhai – Macao link currently under construction in China. The new ShenZhong link will act as a landmark for the entire region, as well as support further economic development. "The design is a synthesis of the requirements and constraints of the Pearl River's estuary where shallow and calm water has been a great inspiration calling for elegance and harmony. The island is designed to minimize blocking effect in the water, the shape similar to a classic Chinese kite and combined with the bridges, the entire link can visualise a kite with tail elegantly landing on the water," says Poul Ove Jensen, architect in DISSING+WEITLING. "The design philosophy of the concept is advanced. The overall design of the link is magnificent, elegant and concise. The design of main bridges, the approach bridges and the artificial islands is integrated, the holistic impression and iconic landmark of the link is prominent, the whole link is in harmony with the surrounding environment, the Y shaped pier shaft of approach bridges give a very strong sense of rhythm." Guangdong is one of the richest provinces in China. Besides agriculture and marine products, the strong provincial economy is largely based on its light and heavy industries, and a major upgrade of the infrastructure is required to support the continuous growth. The new link will be part of this upgrade in and around Guangdong and the Pearl River Delta. Among other advantages, it will create a more direct connection between the West and the North part of the river and thereby decrease the traffic through Guangdong and support a sustainable growth. “The increasing urbanization puts high demands on the infrastructure solutions where functionality, sustainability and aesthetics go hand in hand. Winning this major international competition underlines Denmarks world leading position when it comes to designing major bridges,” says Lars Hauge.